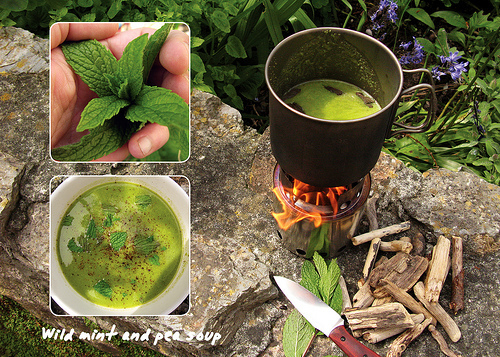 Ingredients: chicken or vegetable stock, garden peas, small chopped onion, garlic glove, a few large sprigs of wild mint. Cook ingredients for about 10mins until the onions are tender. Cool, remove mint and then puree. Reheat and serve with a few mint leaves and some crème fraiche. I come across mint a lot here in Colorado and trim a little where prudent (and allowed). So far I have only made a few teas and a medicine bag that smelled really good. I will try the soup idea.